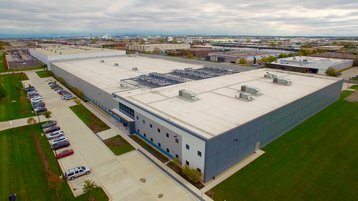 T5 Data Centers is expanding its data center in Chicago, planning to add 2MW of capacity to the 208,000 sq ft (19,320 sq m) site. The original data center was built by Forsythe Technology, and was bought by T5 Data Centers last year. However, Forsythe is still its main tenant - at least, until its potential acquisition by Sirius Computer Solutions. The facility currently comprises two data halls with 10MW of power capacity. The building itself sits on a four-acre property, which the company says holds the potential for further expansion, able to accomodate up to 170,000 sq ft (15,790 sq m) of extra space and another 16MW of power. Founded in 2007, T5 owns seven US data center sites including the Chicago facility. It has recently opened a 10.75MW data center on its Dallas campus, and plans to build multiple data centers as part of a new campus in Fort Worth, in collaboration with local developer Hillwood. For several years, Chicago’s operators have been struggling to keep up with demand in the most populous city in Illinois. According to CBRE, in the first half of 2017, Chicago only had 2.1 percent of available space in its data centers, and most planned capacity was already pre-leased. Some operators have reported they were unable to close deals since they failed to deliver capacity on time.